The Dawn spacecraft just recently entered its lowest and final orbit around the dwarf planet Ceres, providing the closest look ever at the puzzling world. Dawn will, of course, be taking thousands more high-resolution photographs, but what else will it be doing during the remainder of its mission? 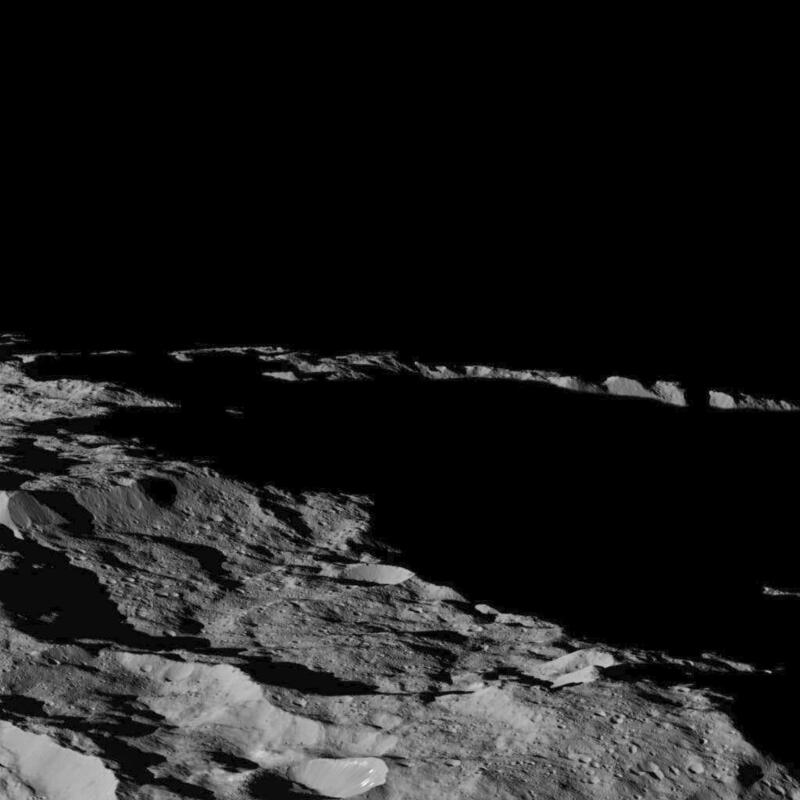 Various aspects of the mission will study Ceres in unprecedented detail. Dawn is now orbiting Ceres at an average altitude of only 385 kilometres (240 miles), which is closer than the International Space Station is to Earth. The images sent back so far have been incredible, but from this close vantage point, they will be even better. More than 16,000 images were sent back by Dawn in 2015, including 2,000 since it entered its lowest orbit. There will be many more to come in 2016. The images have shown Ceres, the largest body in the asteroid belt, to be a complex world, with craters, valleys, mountains, and, of course, those odd white spots that everyone has been talking about. Ceres has been geologically active, at least in the past, and may still be today, the evidence suggests. There may even be hydrothermal activity; the white spots are now thought to be salt deposits left behind after a layer of briny water-ice has been exposed by impacts and sublimated into space (as there is no atmosphere to speak of). The salts identified are consistent with a brine containing magnesium sulphate hexahydrite. Analysis of data also shows that Ceres has a water-ice mantle surrounding a rocky core, and that there may still be at least pockets of liquid water beneath the surface, raising the prospect of potential habitability for microorganisms, as seemingly unlikely as that may sound for a world so far from the Sun. So now that Dawn is in its lowest orbit, called the low altitude mapping orbit (LAMO), what kind of investigations will it be conducting? Dawn will examine two kinds of radiation – gamma ray spectra and neutron spectra – as well as measure Ceres’ gravity field. The instruments used look below the surface of Ceres, rather than the surface as with the camera, visible mapping spectrometer and infrared mapping spectrometer. By studying the radiation using the gamma ray and neutron detector (GRaND), scientists can measure various chemical elements within Ceres. With 21 sensors, GRaND can measure the energy of each gamma ray photon and each neutron. Some gamma rays can be produced by radioactive elements within Ceres itself, but most are byproducts of cosmic rays originating from elsewhere in space. The radiation is also very faint compared to the bright surface seen by the camera, infrared spectrometer, and visible spectrometer. The “images” taken of the radiation require long exposure times of weeks. 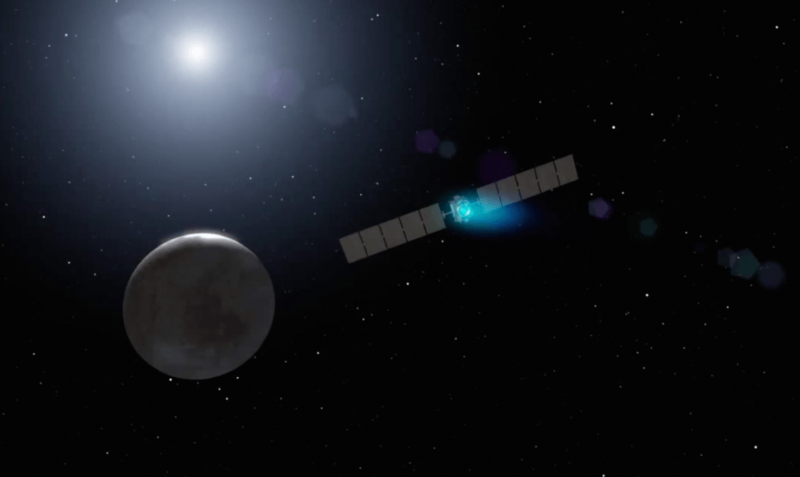 Dawn will also measure the gravity field of Ceres, which will provide more clues to the internal structure of the dwarf planet. Measurements had already been done in the higher orbits, which were already highly accurate, but the new measurements will be even better. The gravitational effects on the spacecraft are strongest when it is close to areas of Ceres with greater density. By measuring the variations, scientists can calculate the distribution of mass within Ceres. Scientists can also measure tiny variations in the velocity of the spacecraft, as accurate as only one foot (0.3 meters) per hour, by using NASA’s Deep Space Network (DSN) to track the radio signal coming from Dawn. By combining all these results, scientists can “see” into the inside of Ceres and better understand what it is composed of. Similar techniques were used when Dawn previously visited the protoplanet Vesta, which showed it to be composed primarily of a dense iron and nickel core surrounded by a less dense mantle and crust. By learning more about the interior of Ceres, as with other bodies in the Solar System, scientists can determine how it formed and how geologically active it has been, or still is. As with other smaller rocky worlds such as Pluto, Ceres has had its surprises, showing evidence for more geological activity than had previously been thought. 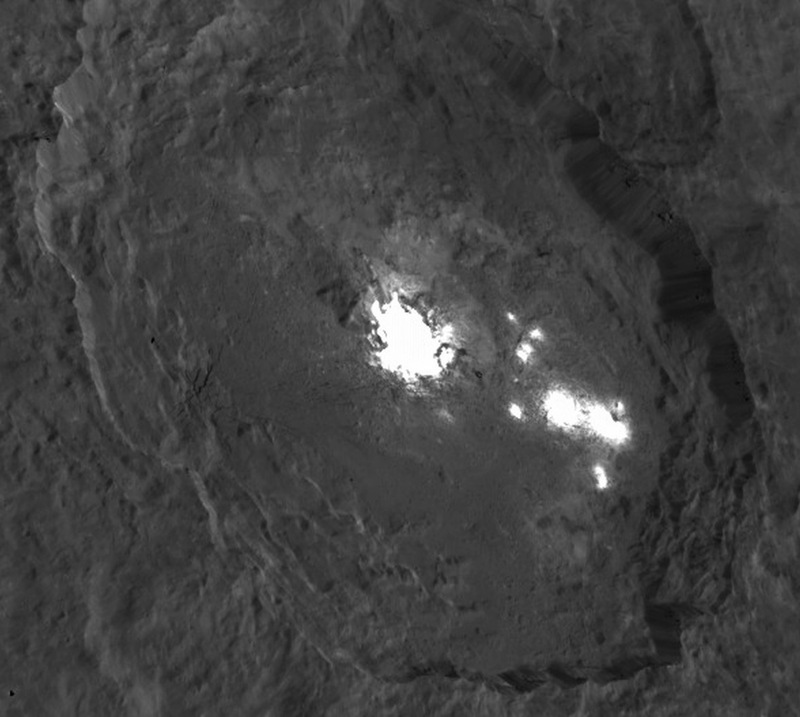 Dawn has also found evidence for clay minerals, or phyllosilicates, on Ceres, using the visible and infrared mapping spectrometer instrument (VIR). They are very common on Earth, and there are likely several different kinds on Ceres as well. One of the surprises found on Ceres was the presence of ammonia in the phyllosilicates. That presents a puzzle, since it is too warm where Ceres is now for ammonia to easily form. It is now theorized that Ceres actually formed farther out in the Solar System, and then gradually migrated inward, as some other bodies have been known to do. Another possibility is that Ceres did form more or less where it orbits now, but other ammonia-rich debris from farther out drifted in and fell on Ceres. “The presence of ammonia-bearing species suggests that Ceres is composed of material accreted in an environment where ammonia and nitrogen were abundant. Consequently, we think that this material originated in the outer cold solar system,” said Maria Cristina De Sanctis, lead author of the study, at the National Institute of Astrophysics in Rome. While taking detailed measurements of the subsurface, Dawn will also, of course, continue to observe the surface itself in incredible detail. The bright spots have been a subject of much discussion, with various theories as to how they formed. While the brightest and best-known spots are in Occator crater, there are over 130 such spots which have been found on Ceres altogether. They appear quite reflective, leading to the idea that they were ice or salt. The latest analysis from Dawn shows them to most likely be salt deposits, such as magnesium sulphate (similar to Epsom salts). The leading theory now is that they are left over from asteroid impacts on Ceres, which briefly excavate a layer of briny water-ice just below the surface. The images of the spots have been increasingly high-resolution as Dawn entered lower orbits, and now, coming soon from this new lowest orbit, they will be even better. Dawn has also observed haze within Occator crater, most likely water vapor, which seems to be related to the spots. The “Lonely Mountain” is another oddity, a conical-shaped mountain about 4 miles (6 kilometers) tall which sits all by itself with no other similar features near it. It is also tangent to a similar-sized crater. How did it get there? With Dawn now firmly locked into its lowest and final orbit, scientists will be able to study Ceres, both inside and out, as never before. Jan. 1 was also the 215th anniversary of Giuseppe Piazzi’s first glimpse of this world as nothing more than a dot of light from his observatory in Sicily. Now, in 2016, we can visit and see this place in a way that he could never have imagined. Paul, thank you for this interesting update. I am confused by the idea about sublimation of water ice. It sounds to me as though the bright spots were places where water ice accumulated by some means…maybe cryovulcanism. Then the exposed ice sublimed away leaving the reflective salt. Makes sense…but why does the rest of the water ice survive? It seems to be covered by a very dark and therefore energy absorbing overburden. Shouldn’t that warm the ice and speed up its sublimation too? 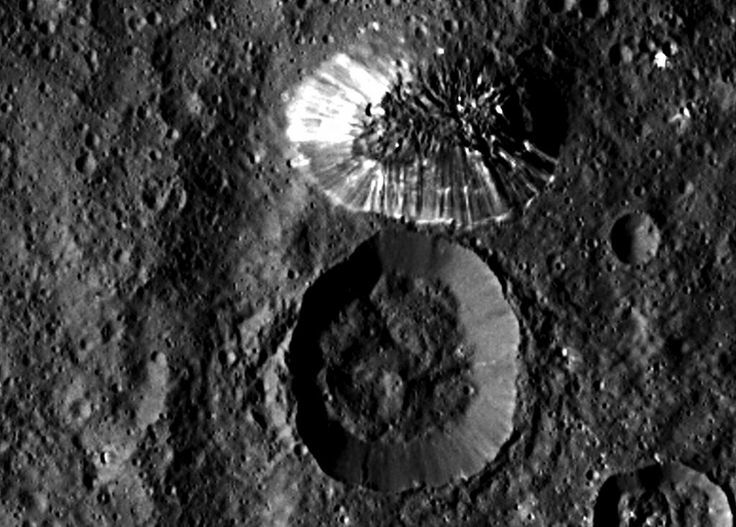 Also, does anyone happen to know if there is a large impact crater on the opposite side of Ceres …opposite the mountain that is? Thanks for doing this blog…I aways look forward to new entries. Would love to send the sister to Curiosity to Ceres and more. Seems we have a good design with her: Lets start mass producing and drive the cost down. Configure customized boost and landing requirements for Curiosity’s sisters to rove: Mercury pole, Ceres, Io, Europa, Ganymede, Callisto, Enceladus, Titan, Triton, etc.